According to the principles of Feng Shui, the effect of a romantic date can be improved by the proper choice of a dinner menu and details of the table decoration. They will help to conn ect the "Qi" energy of both partners, which will strengthen their mutual attraction, establish an environment of mutual understanding and add more tenderness in the relationship of lovers. How should you arrange your romantic dinner, what to cook for this very special night, that would be in the same time delicious and developing a passion? Here are some advises from the Feng Shui experts. Choosing the menu for a romantic evening, take a look at those dishes that you can share with your partner in the literal sense. For example, Feng Shui masters offer to cook neyb (stewed meat and vegetables) and the rice noodles. All ingredients of this dish should be mixed in one pot, and you can eat it from the same plate with your partner. When you are eating from the same plate with your loved one, you "Qi" energies are mixing together, which will put both of you on "the same wave". It is not recommended to include in a romantic menu indigestible (or hardly digestible) dishes, because after you both ate them, you will feel sleepy, which is not so good for the ardent passion. By the opinion of the Feng Shiu specialists, fatty and salty food is attributed to the "Yang" energy, that sets people on a serious way, which is not exactly in the spirit of a romantic date. On the other hand, food that carries too much of the "Yin" energy, also is not very suitable for this case, since it is relaxing people too much. The seafood dishes are carrying exactly the required charge of a romantic date sexuality, so they should be necessarily included in the menu without a doubt. Ice cream or chocolate will help to balance the various flows of energy. So, the sweet desserts would be more than appropriate directly after the seafood dishes. Beverages should also be carefully selected based on their energy properties. Red grape wine complements the seafood dishes perfectly, and a cup of black coffee becomes some sort of tonic, perfectly suited to end your romantic dinner. But the cold drinks and iced beverages should be avoided, because they are filled with the "Yin" energy and may cool down both partners too much. Use for cooking those ingredients, that are containing the "Qi" energy of the Earth and Metal. The first type of energy will help you to create more comfortable atmosphere, and the second - contributes to the subtle mental perception, which will be very helpful in case of the romantic dinner. For this purpose, Feng Shui experts recommend to use honey and ginger. A few words should be said about the choice of setting for a romantic evening. Decorate your table with creamy, pink and red colors, which are associated with sexuality, pleasure and romance. Cream tablecloth, pink napkins, red rose in a vase in the center of the table - all these details will create the necessary mood. 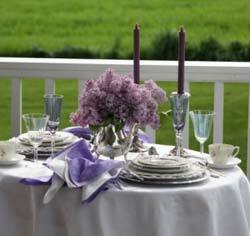 Make sure to arrange the presence of some paired details, such as two candles or two statues on the table - they will symbolize the union of your souls. A good addition to the decoration of the table for a romantic dinner will be different items, made from the shiny metal - that will improve the flow of the "Qi" energy. Put on the table glittering knives, a shining ring on the napkins, candles should stand in the metal candle holders.